Taipei, Dec. 8 (CNA) Taiwan on Sunday called on all concerned parties to "peacefully resolve" their differences over overlapping air defense identification zones (ADIZ) in East Asia. The call came on the heels of South Korea's announcement that it had extended the country's ADIZ to its territorial islets and shoals near the Korean Peninsula. The move followed China's recent announcement of a new ADIZ that covers much of the East China Sea and extends to the disputed Diaoyutai Islands. "The government of the Republic of China on Taiwan is on top of the latest situation and we call on all concerned parties to settle their differences through peaceful means," said Anna Kao, spokeswoman of Taiwan's Ministry of Foreign Affairs. 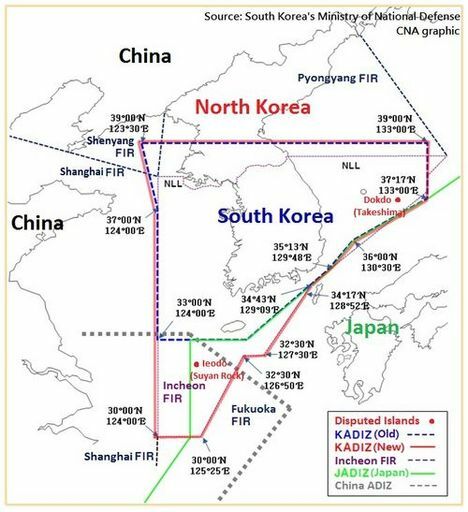 China's unusually large ADIZ raised tensions between China and both the United States and Japan, because Japan currently administers the island group and the U.S. has a treaty obligation to support Japan's national defense. The United States described China's new zone as "dangerous and provocative" and said it increased the risk of triggering a crisis, but Beijing has not backed down. In calling for a peaceful resolution of the issue, Kao reiterated the principles articulated in the East China Sea Peace Initiative proposed by President Ma Ying-jeou on Aug. 5, 2012. The initiative calls on all parties in East China Sea territorial disputes to exercise self-restraint, not escalate tensions, shelve controversies, maintain dialogue and respect international law. With tensions in the region flaring up over respective ADIZ claims, Kao said the ROC called on the parties involved to deal with the disputes through peaceful dialogue and maintain peace and stability in the region. Taiwan, Japan and China all claim the Diaoyutais, which lie some 100 nautical miles northeast of Taiwan.